Check out the West Sleeping Porch’s new arrangement on your next visit! From 1914-1919, the Pittocks used the West Sleeping Porch as a bedroom for some of daughter Lucy and son-in-law Edward Gantenbein’s three children. The porch is now furnished to reflect this use. Pittock descendants donated the bed on the right several years ago. It was likely used by Pittock grandchildren here at Pittock Mansion. This past summer a conservator cleaned and stabilized the bed, enabling us to place it on display. Recently, another donor gave us the bed on the left. 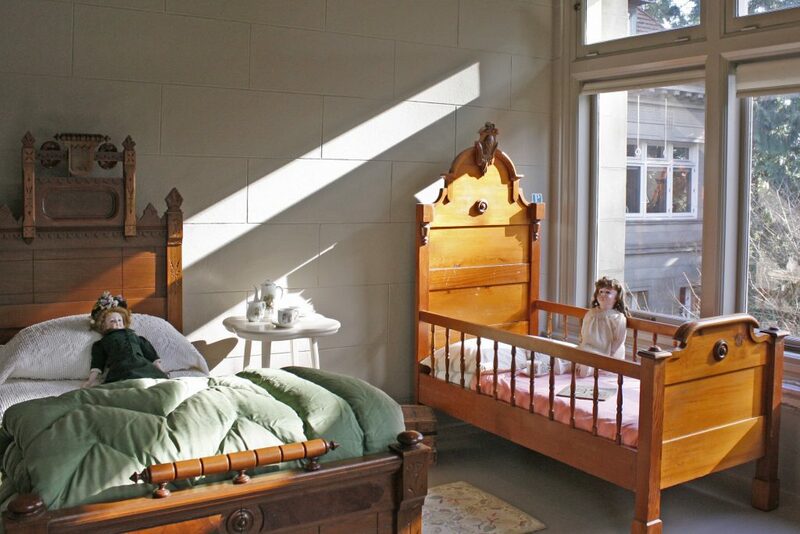 The bed was made in 1895 by Portland furniture maker Daniel Wennerberg. Wennerberg also created the bed, dresser, and secretary currently on display in the South Bedroom and the Writing Room.